At $49,995, Would Buying This 1984 Audi Quattro Put You Off to a Good Start? Today’s Nice Price or Crack Pipe Audi is where it all began. This Ur-Quattro is the road-going edition of Audi’s WRC-dominating rally rocket, the racer that proved AWD was a force with which to be reckoned. Let’s see if this one’s price might be a reckoning of a different kind. So, yesterday was one of those crazy days where I had to vote to sway the poll away from a 50/50 split. Oh the things I do maintain some sanity around here. We were looking at a 2002 Honda Odyssey minivan and while those are generally radioactive at nearly any price owing to their cursed automatics, this one had been converted to a five speed manual by some laudable mad lad. A $6,000 price tag proved a challenge, but in the end—and with my help—the van started us off this week with a solid 57 percent Nice Price win. See? Every vote does matter. Remember that should you be heading out to do your civic duty today. When it comes to Audi, you might not think much of the Quattro name these days. I mean, it’s applied to pretty much every model across the board, from the crazy little A1 quattro to the even crazier and bigger R8 quattro. That wasn’t always the case however. Every story has a beginning, and today’s 1984 Audi Quattro Coupe represents the first page of the Quattro saga. Originally developed to take advantage of changes in the FISA rule book that allowed AWD, the turbocharged Quattro soon came to dominate the loosey goosey circuits, going so far as to win the manufacturer championship for its class in 1983. The reason the racing organization allowed the AWD Quattro to compete was because Audi convinced them that the model was a full-blown production car. Audi did homologate the model in limited numbers. Very limited. A handful of those limited numbers made their way to America in full federalized form, although they lost some of their edge in the process. All told, only 664 Ur-Quattros made it across the Atlantic before Audi unceremoniously turned off the tap. According to the ad, this one was originally sold through a Porsche+Audi dealer in Rochester, NY. It’s presently a three-owner car and is said to have been well maintained over the course of its life. Aesthetically, it’s in pretty nice, albeit not Concours, condition. The Amazon Blue paint is an underrepresented color choice and it’s appreciable that the car still carries all the period correct decals atop that. The factory Fuchs exhibit a good bit of finish wear, likely from age and overly aggressive car washes, and not from encounters with the curb. Michelin tires of an unknown age wrap around those. Up front the car has been imbued with a set of European headlamps, a nice update from the U.S. sealed beams that originally lit the way. The Federalized bumpers also appear to have been tucked in from their original battering ram proportions. The interior is more of a mixed bag. The Sierra Beige leather on the seats is certainly showing its age, as are many of the plastic bits inside. A few of those have warped, wrinkled or appear a bit discolored. There’s nothing that’s unexpected, and in fact the interior shows appreciable well for its age. Still, this is not a museum quality display. The mechanicals seemed to have faired better with the 2.1-litre turbo five cylinder claimed to have undergone a full rebuild. Paired to that is a five-speed stick and of course Audi’s Quattro AWD system. Bilstein shocks sit at each corner and new brake pads have been installed as well. Extensive maintenance records are said to be available, and the car comes with both a clean title and just 102,000 miles under its wheels. The asking is a heady $49,995, which would be crazy talk for any other 1984 Audi. This however, isn’t just any Audi, it’s a member of a rarified group, one that won rally championships and set Audi one the path to a four-wheel drive future. It’s also a stone cold Fox-successor and like the E30 M3, Porsche 911SC or Ferrari 328 of the era, its legend and following outweighs its seeming paucity of performance as gauged by modern standards. Ahh yes that’s all well and good, but could this particular one be worth that fiver-shy of fifty grand asking? eBay out of Boise, ID, or go here if the ad disappears. 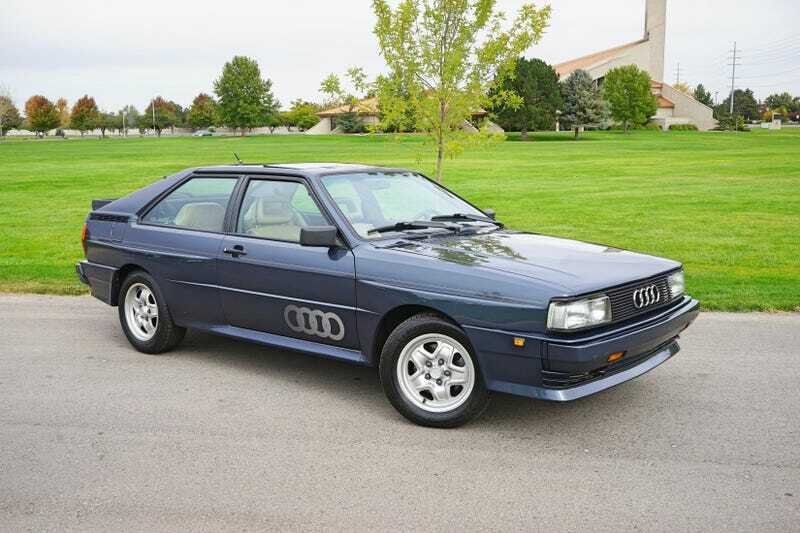 How About A 1985 Audi Ur Quattro for $79,950?